Discussion in 'Science' started by OldManOnFire, Aug 6, 2018. Global warming is caused by the burning of fossil fuels such as oil, gas and coal, which release greenhouse gases like carbon dioxide into the atmosphere and oceans. Those gases have caused global temperatures to rise to levels that cannot be explained by natural causes. Part of the Siberia - Iceland geothermal system. Not times of more and less activity. Can I sell you a bridge in NYC? All geothermal, like volcanic activity must be very regular and constant all around the world! Just like earth quakes! But I do not deny that higher co2 can help speed up the natural climate change, which will happen with or without co2 levels increasing. I do not know for sure, and neither do the scientists, what the long term effects will be. I just don't buy into the doomsday predictions is all. Reminds me too much of religion and their doomsday predictions. And will probably be as true as those from Revelations in the NT. How about that bridge in NYC. You tell us. Have you looked to see if anyone has looked? Have you considered for even one fleeting second that the people who taught you all of that and dedicated their lives to these fields of science, just MIGHT have thought of that before you did? I do not know for sure, and neither do the scientists, what the long term effects will be. That's quite the obtuse statement. In reality, scientists have a pretty good idea what adding formerly fixed carbon to our carbon cycle will do. it is tough finding anything on tectonic activity at the North Pole. Searches usually steer one to the South Pole and volcanic activity. passes right under the North Pole to meet up with the North American Plate. What their current activity is I do not know. Most search results get into the magnetic pole, Antarctica, and stuff. The hunt continues. Wanna help? Current activity of North American - Eurasian plates at North Pole. Have you used google scholar? Such gaps getting bigger does get around to releasing lava doesn't it. Or heat. Geothermal heat. Although not where this diver is swimming. Where do you think I get all the research papers I link to? Maybe you can find something on the North American Plate, Eurasian Plate at the North Pole. Specifically anything relating to geothermal activity. I get gibberish when I try. And I was lucky to find anything on north pole plate tectonics. Aren't you part of this now you might lend your search talents and experience? That is the website for the US Geological Survey. That is a scientific society for geologists. Geologists are who are going to teach you about plate tectonics and who discovered and taught us everything we know about it. While you are there, you may spot the society's official endorsement of the scientific consensus. on man-made climate change. give us the benefit of your experience and not just advice. 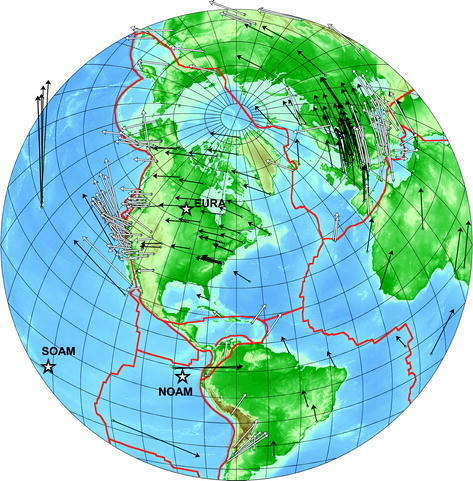 My research revealed there is a tectonic plate boundary pretty near under the North Pole. The Eurasian plate and the North American plate are separating creating a gap there at the North Pole. It is part of the same fault line that divides Iceland demonstrating gap creation can certainly release heat. Anyone wanna jump in and see what there is about geothermal activity and the North Pole, please share. I did find it is reasonable to suspect it. Si? Geothermal energy is also very low relative to other sources of heat. For example geothermal energy is about 0.1 W/m2 whereas solar radiation is 340 W/m2. Even a doubling of CO2 produces a forcing of 5.35 * ln(2) = 3.7 W/m2. So while geothermal is a constant steady and quantifiable source of heat it is completely dwarfed by other radiative forcing mechanisms. Edit: And not be forgotten, tidal frictional is another source of energy. This energy comes from the dissipation of angular momentum via tidal forces between the Earth and Moon causing stretching and bending and thus friction of land and oceans. The Earth absorbs about 3.75 TW of this energy and when divided by the the surface area this is equivalent to a very underwhelming 0.01 W/m2 or about 1/10th of the total geothermal energy most of which comes from radioactive decay. Geothermal energy released to the surface. Shall we get to the core of the issue? That's where the real heat is created. Any news on Geothermal events by the North Pole where the Eurasian and North American tectonic plates are pulling apart just like fiery Iceland ? No. The research of lifelong scientists, acting in concert across several fields of science, revealed that. These same scientists also endorse the consensus on climate change. iamanonman and Bowerbird like this.